Originally built in 1975, Glen Lochen was a vibrant local institution, housing first-class restaurants, shopping, and offices. However, Over nearly forty years, time and neglect contributed to the dilapidation of the building. glen lochen was acquired by new york city based real estate firm, tse group, in 2011. 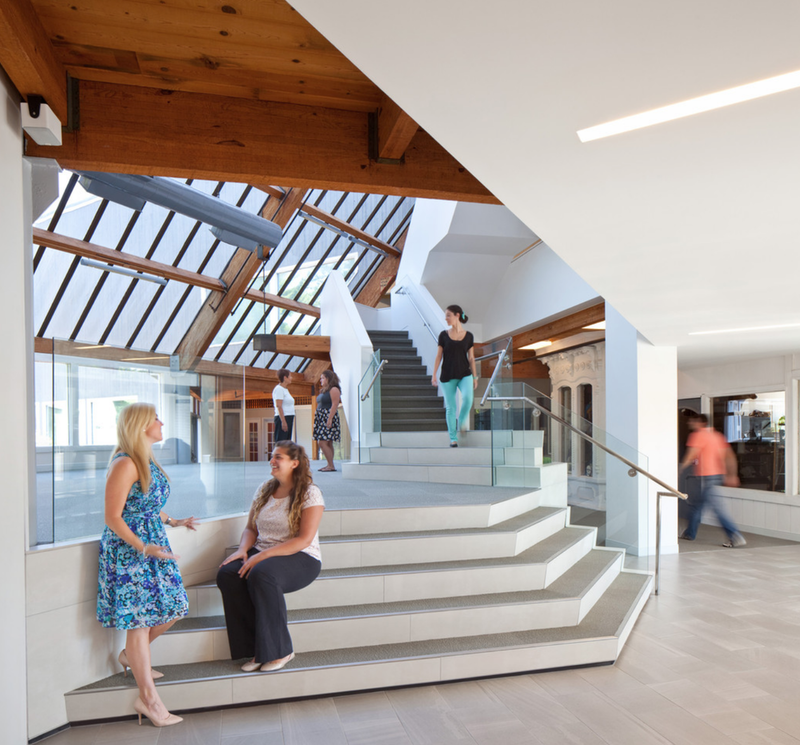 With the help of Amenta Emma Architects, Edward Stanley Engineers, Silva Engineering, and Tall Construction Company, Glen Lochen was given a re-invented identity for the site features, building exterior and interior common spaces. With a mixed-use commercial program. this building-overhall featured ground floor retail and dining with office spaces on the second and third floors. An undulating zinc armature stretching the entire length of the main façade serves as the cohesive element in the vocabulary of the new building and frames the new glass and Cumaru wood entry to the building. The existing signature element of the building – a triangular volume jetting out towards the street atop slender columns – was reimagined to preserve the recognizable icon while announcing the property’s transformation with its new transparent glass curtain wall. THe main focus was to redevelop the central atrium and staircase to serve as the hub for occupant interaction and informal activities. 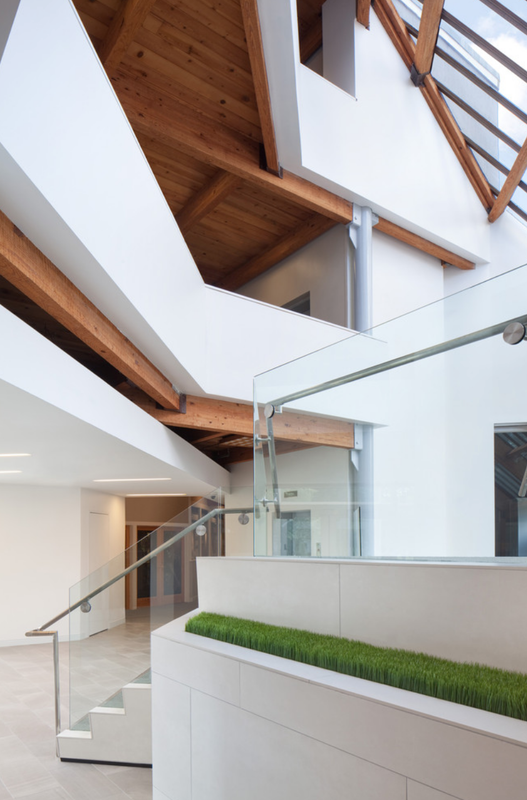 A new suspended soffit extends through the common spaces to conceal previous exposed electrical busways and provides additional lighting in the corridors. The renovation has helped restore this local cultural landmark and has already proved successful in drawing occupants and visitors. This project was an architect-led design build effort that was conceived, drawn, permitted, procured, constructed and managed by a single firm of dedicated professionals committed to the synthesis of design and building. Incorporated in 1693, Glastonbury is one of Connecticut’s oldest municipalities. Conveniently located approximately 10 miles southeast of Hartford, the state’s capital city, our nearly 35,000 residents enjoy the many historic sites, picturesque parks and open spaces, convenient access to the CT River, and countless programs & activities made available by the Town and other community organizations. Glastonbury is proud to be well known for its outstanding public education, excellent municipal management and exceptionally high quality of life. 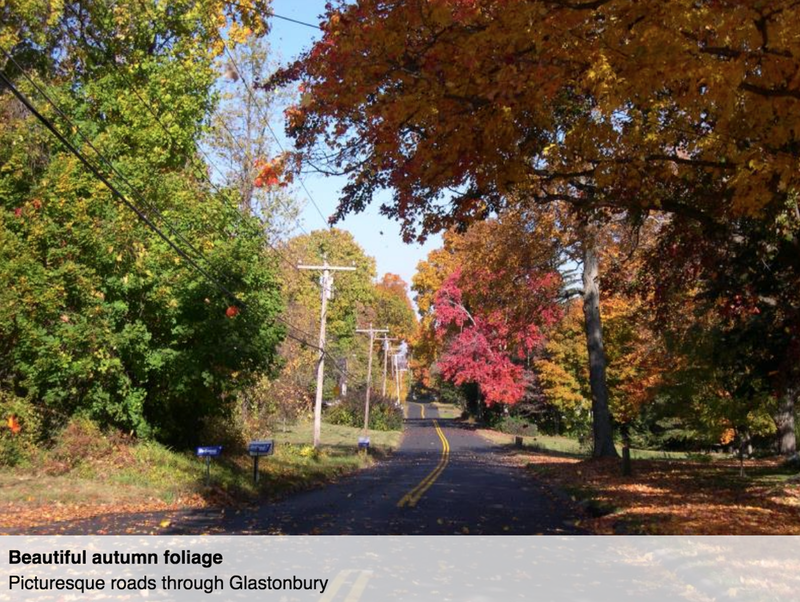 Glastonbury is abundant with beautiful parks, recreational spaces, and historic sites. Residents and visitors enjoy these scenic locations year round and many sites serve as the venue for annual festivals and community events. In addition to our recreational attractions, Glastonbury dwellers frequent our shopping and retail locations and dine at a fantastic selection of restaurants, bars and cafes. Explore our Town through the links below to find activities, attractions and events that fit your interests!